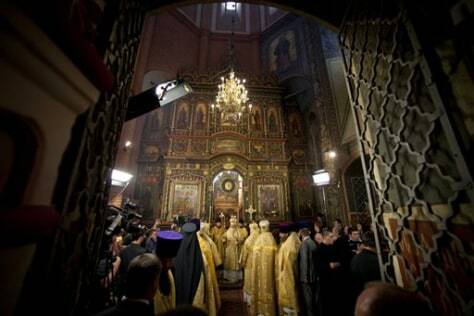 Orthodox Church Patriarch Kirill, background, conducts a religious service at St. Basil's Cathedral outside the Kremlin on the Red Square in Moscow, Russia, on Tuesday, July 12. The cathedral is turning 450 years and parts of its interior will open after a decade-long restoration.